1. To make the shoes, create a cone shape with some red clay. Estimate the size based on the size of the foam balls you will use for body. 2. Press the base of cone to form the heel. Curl the thinnest end back on itself to form the toe. 3. Create 2 long cylinders of white clay for the legs. Fold legs in middle to form the knee joint and position as shown below. 4. Attach the legs to shoes as shown below. 5. Place the legs on a base of your choice. See photo in step 7 for positioning. Optional: Carve an expanded polystyrene base into an irregular shape. Texture the base and paint it green. 6. To form the elf's body, embed a No. 3 Styrofoam ball in red clay. Start with a ball of clay about the same size as the foam ball and wrap it around being careful not to trap any air. Create a pear-shaped body by extending the clay at one end (shape as shown in step 7). 7. Glue the body onto the legs in position shown below. 8. Start with 2 cylinders of white clay to model the arms. Roll some green clay into a thin strip and cut some green stripes from it. Wrap arm cylinders with green stripes as shown below. Use glue to attach. Fold arms in middle to form the elbow joint and set aside for now. 9. Model hands with flesh tone clay. Use scissors or a modeling tool to separate the thumb and mark 3 fingers. Make 2 hands and glue them onto end of each arm. Attach arms to body, resting hands on legs as shown below. Make a small ball of white and attach to neck area for collar, pressing down to flatten a little. Insert a toothpick or wire in neck (for supporting the head). 10. For head, cover a No. 4 Styrofoam ball with flesh colored clay using the same method as step 6 except maintaining roundness. Attach a round ball of flesh-colored clay for nose. Form 2 teardrops of flesh-colored clay for the ears. Apply to side of head and use modeling tool to dimple the ears, using photo as example. Use toothpick to make a hole in bottom of head to attach to neck but let head dry before painting eyes with acrylic paints (or apply a pair of water-slide eye decals). 11. Make the cap from an elongated cone of red clay. Hollow out the base to fit elf's head. Add ear flaps if desired. 12. Glue the head to the body and place the cap on it. Mark different folds with modeling tool, giving motion to the cap and curl the tip. Use small balls of green clay for buttons. Press onto body using modeling tool. Mark a couple of buttonholes with needle tool. Make some more elves sitting in different positions or with different expressions.....or make them in many different colors for lots of occasions. Below they are shown with little name signs as placeholders for a Christmas dinner party. Note that candy canes, holly and other festive icons have been added. **Update: Using cake decorator colorants (such as Wilton Set of 8 Icing Colors or AmeriColor #1 Color Kit Soft Gel Paste Food Color, 12 Pack ) might give you a brighter red or green than using acrylic paints to pre-tint clay. I also think it's less messy than using paints to pre-tint. However, if you don't have any of the paste colorants, artist acrylics will give you stronger color than craft paints because they contain more pigment. what a beautiful figurine, and so well told. thankyou. Where can I get water-slide eye decals? Thanks for your answer. Hi, Sorry I didn't answer this sooner....I really don't have an answer. Sorry. They're not easy to find in USA but readily available in South America. All we can do is keep searching for an online source. I've been thinking of buying some water slide ink jet paper and making some for myself. Can you please tell me what kind of glue do you use with CP, and do you glue the parts together when the "clay" is still soft or do you wait for it to dry? Just about any good quality white glue will work. I mostly use Aleene's Tacky Glue but also use good ole Elmer's Glue. You can use the white glue when clay is still soft and "wet" or you can use it dry. CP will stick to itself when attaching wet onto wet but you should always add glue when sticking wet to dry. Just a little bit of glue is all that's needed in most cases. I finally found a place which sale CP. However, when I opened the bag I got to think that this is an old package that they sold me. The CP wasn't very soft and when I tried to attach 2 "wet" pieces together, they simply fell apart. I also tried to create a small ball (for a face) and it didn't work. It's like it wants to go back to it's original shape. How wet or soft should a CP be? Is there something I can add to a CP that went old? I've noticed that there is no expiration date on the package, how long is CP good for if it's in the original package? How long a shelf life CP has can vary a lot, depending on storage conditions and other things. It should be soft and stretchy. I don't know if you can fix the batch you've been sent. Do some experimenting with small amounts of the CP. Add some water and knead in, see if that helps...maybe try adding some cold cream or some baby oil. It's hard to say what might work without actually seeing it. 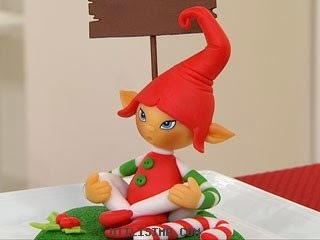 Mary, would you mind sharing the CP recipe that you used when you created this elf. I have made several batches and they all turn out the correct consistency where they stretch into teardrops, but they seem to melt somewhat under its own weight when making the legs and the arms. Whereas yours seems to be the consistency of polymer clay when you are making the legs and the arms. I prefer Basic recipe #1 for microwaving (by Sangeeta), but this recipe also seems to melt. What am I doing wrong? Even the top of the hat has dropped over and rested against the rest of the hat. I would love to make this, but the pictures are missing. Can this please be fixed. Also the link to the original post isn't correct. Can this also please be fixed. Any chance that the pictures could be relinked please? Again, any chance the pictures can be relinked so I can make this, please?